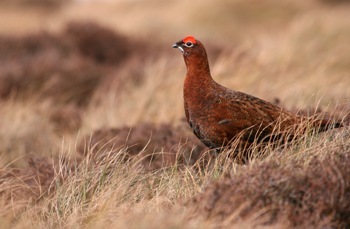 One of the few bird species to be found all year round on the fells, the red grouse is a popular game bird, with much of the moorland management targeted at benefiting this species. Plump with small head, slightly hook-tipped bill and short black tail, often appearing hunched up. Adult has reddish-brown, mottled plumage with white stripe on underwing. Most easily recognised by its 'go back, go back' alarm call.